Vector Laboratories enzyme substrates produce a range of sensitivities across a broad palette of colors. Consider the following factors when choosing a substrate to match the enzyme in your detection system and your application. Sensitivity. Substrates differ in sensitivity. Some may increase in sensitivity with longer incubation times. Color. Color contrast is essential in multiple antigen labeling applications, in pigmented tissues such as melanomas, and in counterstained tissues. Where performance is equal, color choices might also depend on personal preference. Visualization. Visualization options include brightfield, fluorescence, darkfield, electron microscopy, and spectral imaging. Heat Resistance. For IHC/ISH double-labeling applications, the heatresistant substrate is applied first with an IHC protocol, followed by ISH detection that includes a heat denaturation step. In multiple antigen labeling procedures requiring additional applications of heat-induced epitope retrieval (HIER), apply the heat-resistant substrate first. 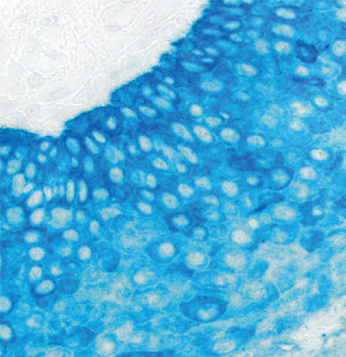 Tonsil: Cytokeratin AE1/AE3 (m), ImmPRESS™-AP Anti-Mouse IgG, Vector® Blue (blue).